incident in which six others were injured. against their impending eviction from the capital’s Boeung Kak lakeside. the throat,” Suong Sophorn said. room for a 133-hectare development owned by a ruling party senator. 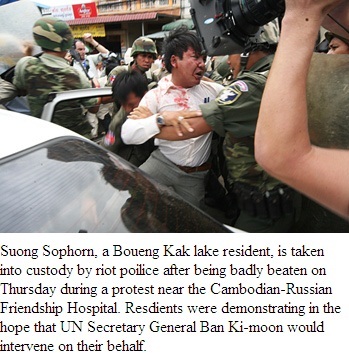 “Suong Sophorn pushed the authorities and then hit his head against the police car door,” Sok Penhvuth said.